I heard a story today about a police officer that pulled someone over and he thought it was going to be routine. As he approaches the vehicle he smells alcohol and knows that this is going to be anything but routine. It turns out that the driver is a parolee that was released the day before and he has a gun in his waistband. This felon does not want to return to prison. The Cop orders the man out the vehicle and he tells the man to turn around so he can be patted down. The perp has no intention of getting arrested so he whips around and pulls the gun out of his waist and points it at the officer. At this point the policeman is more than an arms length from the parolee and the gun. In a quick second he runs this scenario in his head. 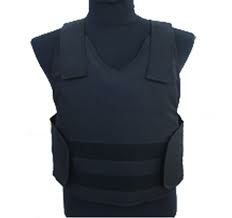 Police are trained to put their vests on everyday so that if they are ever in a situation such as this, they can trust THAT the vest will save them from a bullet provided it is not aimed at their head. In this moment, he tightens his stomach muscles and trusts IN his vest to absorb the first shot so that he can reach his gun and get off a shot. 10Finally, be strong in the Lord and in his mighty power. 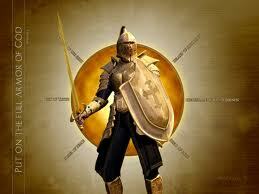 11Put on the full armor of God so that you can take your stand against the devil’s schemes. 12For our struggle is not against flesh and blood, but against the rulers, against the authorities, against the powers of this dark world and against the spiritual forces of evil in the heavenly realms. 13Therefore put on the full armor of God, so that when the day of evil comes, you may be able to stand your ground, and after you have done everything, to stand. 14Stand firm then, with the belt of truth buckled around your waist, with the breastplate of righteousness in place, 15and with your feet fitted with the readiness that comes from the gospel of peace. 16In addition to all this, take up the shield of faith, with which you can extinguish all the flaming arrows of the evil one. 17Take the helmet of salvation and the sword of the Spirit, which is the word of God. 18And pray in the Spirit on all occasions with all kinds of prayers and requests. With this in mind, be alert and always keep on praying for all the saints.Or are you going to put on the Armor of God and trust IN Him who controls the universe and everything in it. My Brothers and Sisters….Trust IN Him the Living God, have that personal relationship with Him and trust IN Him so that you can defeat anything that comes your way that is not of Him.